Ernest Tubb was one of biggest and most influential stars in the history of country music, his hit-making career covering nearly four decades as he racked up around 90 country and pop chart entries, beginning with his landmark “Walking The Floor Over You” in 1941, which effectively pioneered the honky-tonk sound in commercial country music. He was known as “The Texas Troubadour”, a name he also gave to his band, which always comprised the cream of Nashville’s musicians, notably, in the early days, Jimmy Short, who developed the single-string picking style that characterised Tubbs’ recordings. His many hits included the original versions of songs that became iconic country standards, such as “Blue Christmas”, popularised by Elvis Presley, and “I Love You Because”, later a huge hit for Jim Reeves. 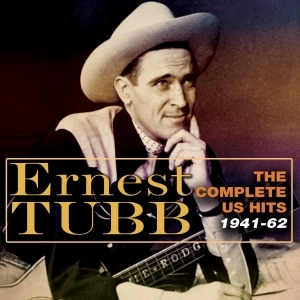 This great value 71-track 3-CD collection comprises every Ernest Tubbs record which featured in the US country or pop charts during the two decades and more which it covers, including his hit duets with Red Foley, The Andrews Sisters and The Wilburn Brothers. It’s a definitive snapshot of the core hit career of one of the true pioneers of modern Nashville country.